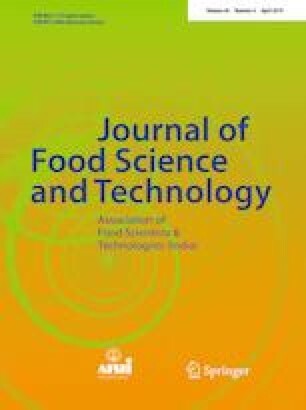 Fifteen cultivated (Ten desi, five kabuli) and fifteen wild species of chickpea (Cicer arietinum L.) were compared for nutritional traits, antinutritional factors and antioxidant potential. The average crude protein content in desi, kabuli and wild species was found to be 25.31%, 24.67% and 24.30%, respectively; total soluble sugars in these genotypes were 38.08, 43.75 and 33.20 mg/g, respectively and total starch content in these genotypes was 34.43, 33.43 and 28.77%. Wild species had higher antioxidant potential as compared to cultivated genotypes due to higher free radical scavenging activity, ferric reducing antioxidant power and reducing power. Kabuli genotypes had lower antioxidant potential than desi genotypes. Desi genotype, GL 12021 had high crude protein and total starch content, lower phytic acid and saponin content and higher antioxidant potential. GNG 2171 had high crude protein and total soluble sugar content and lower tannin and phytic acid content. Kabuli genotype L 552 possessed high total soluble sugar and total starch content, high Zn and Fe content and lower tannin, saponin and trypsin inhibitor content. Wild species C. pin ILWC 261 had high crude protein, lower phytic acid and trypsin inhibitor content and higher DPPH radical scavenging activity and hydroxyl radical scavenging activity. The observed diversity for quality traits in cultivated and wild genotypes can be further used.